Values the section contains data items that define the share of pie segments. 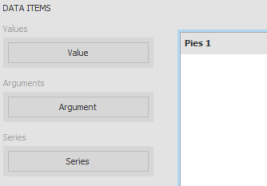 Arguments the section contains data items that provide values used to label pie segments. Series the section contains data items whose values are used to label pie charts. All buttons for customizing the dashboard item Pies are on the Design tab. To control how pies are arranged, use the Content Arrangement group in the Design Ribbon tab. By default, the Auto Arrange option is enabled, which automatically resizes pies to fit within the dashboard item. You can also specify the number of columns in which pies are arranged. Click the Arrange in Columns button and specify the appropriate number in the Count field. Similarly, you can arrange pies in a specific number of rows. Pies display data labels that contain descriptions for pie segments, and provide tooltips with additional information. You can specify which information should be displayed within data labels and tooltips. To do this, use the Data Labels and Tooltips buttons in the Design Ribbon tab. These buttons invoke the drop-down menu, which is similar for both buttons. This menu allows you to specify which values are displayed within data labels or tooltips. Define the visibility of the pie caption via the Show Pie Captions button. Select the diagram style, use the Pie and Donut buttons in the Style group of the Design Ribbon tab. The Pie dashboard item supports filtering by argument or series values. When filtering by arguments is enabled, an end-user can click a pie segment to make other dashboard items display only data related to selected argument values. Click the Arguments button in the Data Ribbon tab. When filtering by series is enabled, an end-user can click a pie to make other dashboard items display only data related to the selected pie. Click the Series button in the Data Ribbon tab. The Pie dashboard item supports drill-down on argument or series values. When drill-down on arguments is enabled, an end-user can click a pie segment to view a detail chart for the corresponding argument value. Drill-down on arguments requires that the Arguments section contains several data items, from the least detailed to the most detailed item. Click Arguments in the Data Ribbon tab. When drill-down on series is enabled, an end-user can click a pie to view a detail chart for the corresponding series. Drill-down on series requires that the Series section contains several data items, from the least detailed to the most detailed item. Click Series in the Data Ribbon tab. Pies - InLoox • Copyright 1999-2019 © InLoox, Inc. All rights reserved.